I can’t speak for anyone else but I still know the exact moment I fell for the dark haired beauty who hailed from London, England. 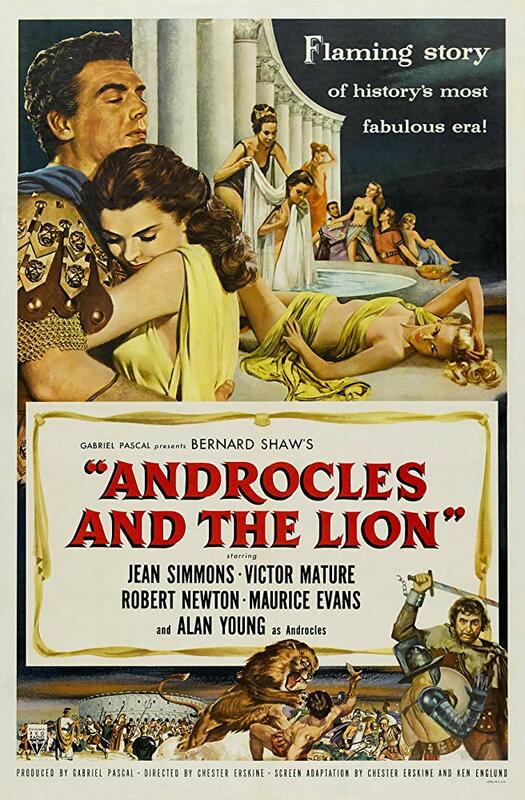 The VHS age was upon us which resulted in this teenage boy finally getting to see the Kirk Doulas big screen epic that promised gladiators, blood and legions of Roman armies battling against my hero Kirk Douglas and his ragtag group of guerilla fighters that included Tony Curtis and John Ireland. I even recognized Woody Strode’s name in the credits. Once the film began it took me all of a few seconds to be enraptured by the tenderness of Varinia the slave girl who would go on to capture the heart of Spartacus as well as yours truly. To this day I still look upon Stanley Kubrick’s film as a love story at heart and after years of repeated viewings I’m still caught up in Miss Simmon’s on screen beauty and the performance she gives in this magnificent film that helped to break the blacklist. 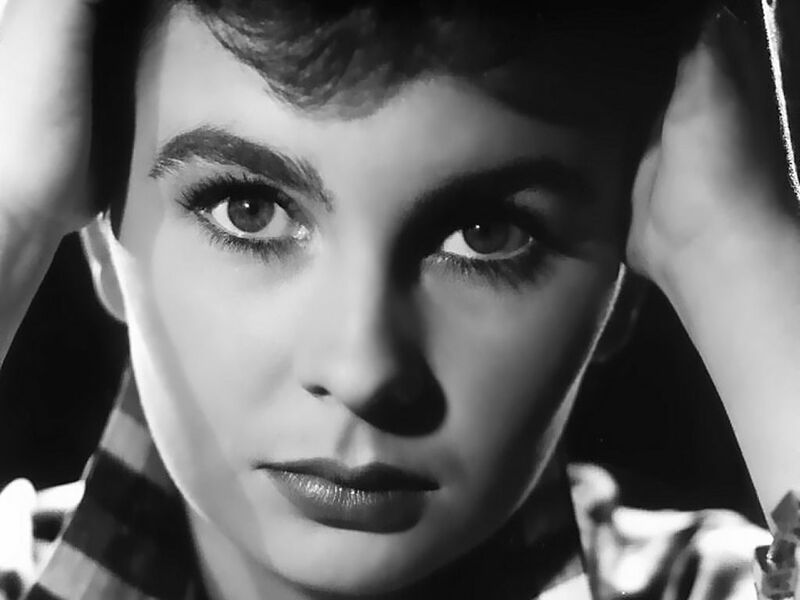 I’ve been meaning to share my love of Jean Simmons here at Mike’s Take for far too long and thanks to Laura over at Phyllis Loves Classic Movies and Virginie at The Wonderful World of Cinema I’m doing just that. 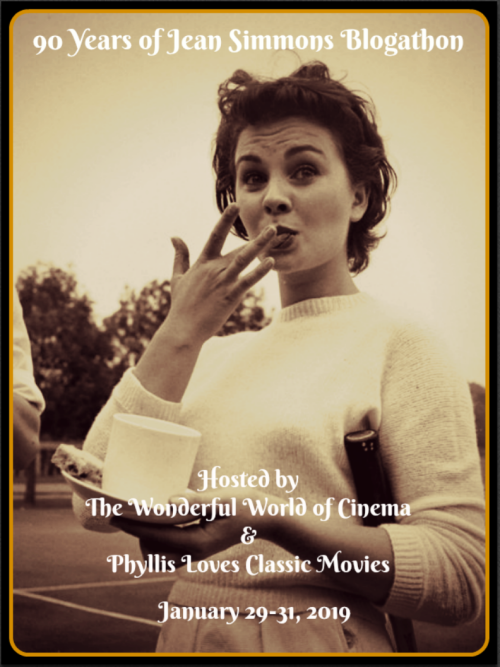 They’ve taken the time to pay tribute to this wonderful actress by hosting the 90 Years of Jean Simmons Blogathon. Be sure to follow the links and see what others have to say about the lady who melted this wannabe tough guy’s heart all those years ago. 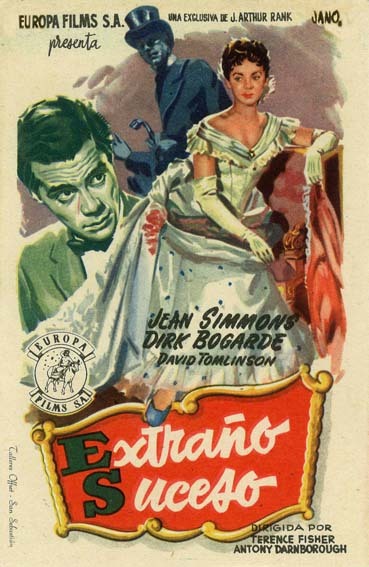 1950 brought So Long at the Fair with Jean opposite Dirk Bogarde. 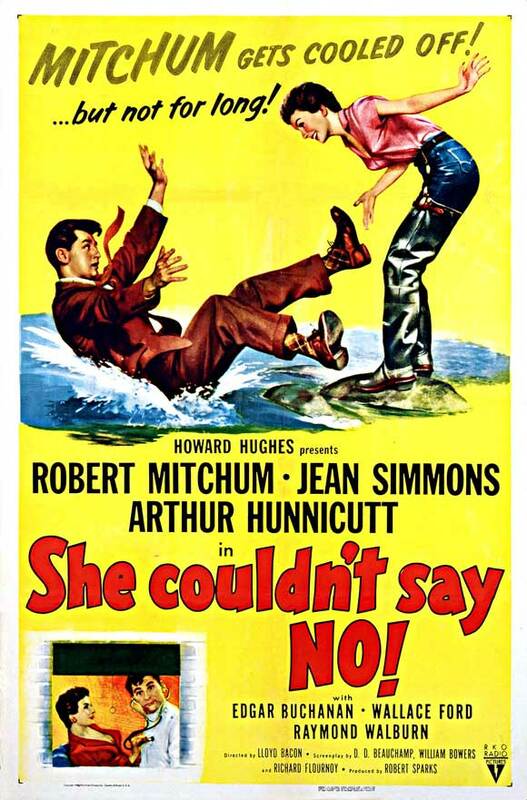 Tangling with Robert Mitchum in a pair of early 50’s flicks, She Couldn’t Say No and Angel Face. Teamed with Vic Mature in a pair of releases around those Mitchum titles. Just who is this Granger guy threatening the lovely Miss Simmons? 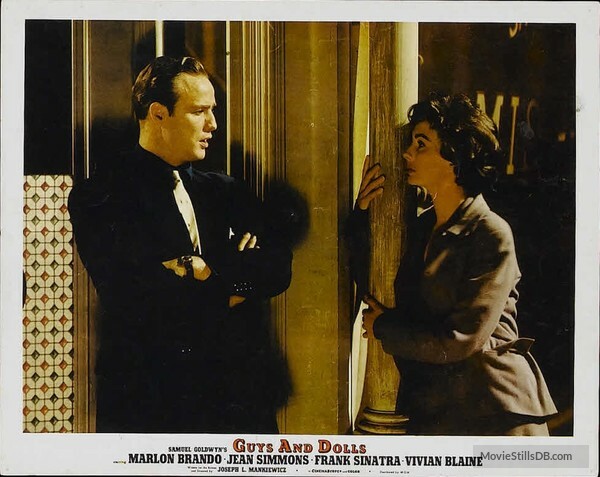 A second go around with Brando in Guys and Dolls following Desiree. Adding the name Paul Newman to her long list of accomplished co-stars. A front row seat for Jean opposite Burt’s Oscar winning performance. Rounding out a top notch cast of legendary names for some weekend fun. I’ve yet to see this dramatic turn from Miss Simmons. Any fans? 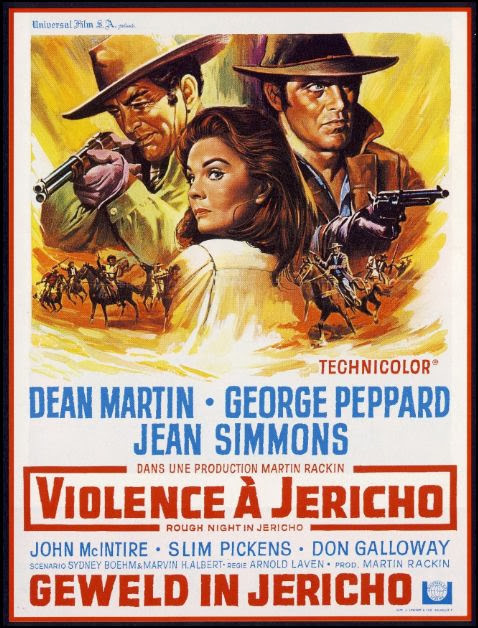 Going west with Dino and Mr. Peppard. Plenty of other titles I could have featured here and maybe I’ve missed your favorite all together. I do apologize but so many fine posters and images to choose from. Hope you won’t mind but I did go digging through the archives here at the headquarters of Mike’s Take and I’ve located a couple of classic one sheets of my own to share of the lovely Jean Simmons. Forgive me but it’s the only way I’ll ever get my “mug” into the same frame as this lovely lady. Now please take the time to scroll back up and follow those links to read more about this beautiful woman who graced the silver screen. Thank you Mike. In 1975 I had the great good fortune to see Miss Simmons on stage in “A Little Night Music” in London. I love the musical and Miss Simmons was luminous. 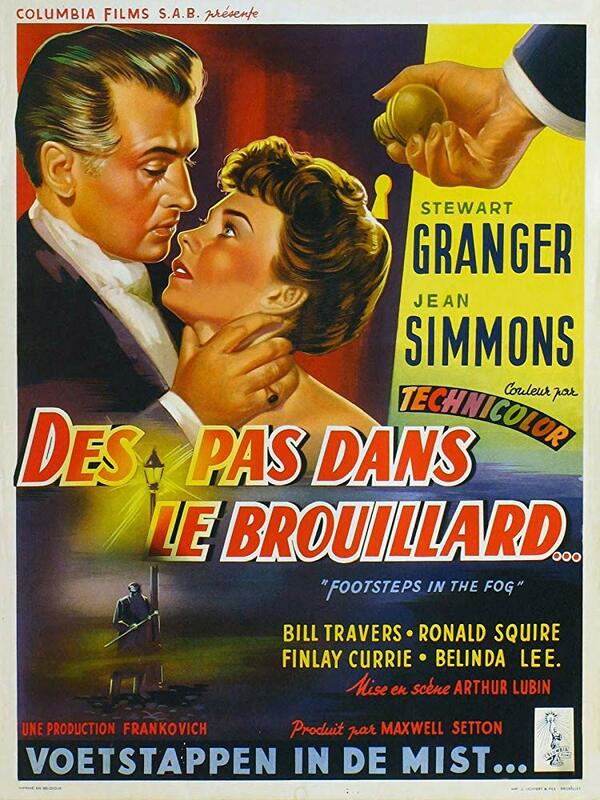 I am grateful for the great collection of Film posters showing Miss Simmons. Spartacus is my personal favourite among her substantial body of work; she is beautiful and the film is very intelligent and engaging. I have never seen a film where her performance was less than excellent. 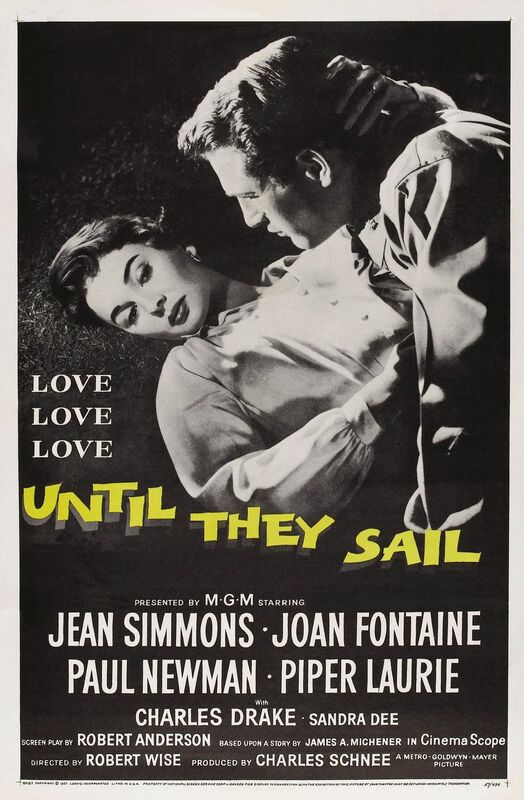 I have always loved Jean Simmons, but am not persuaded that Hollywood knew what to do with her. 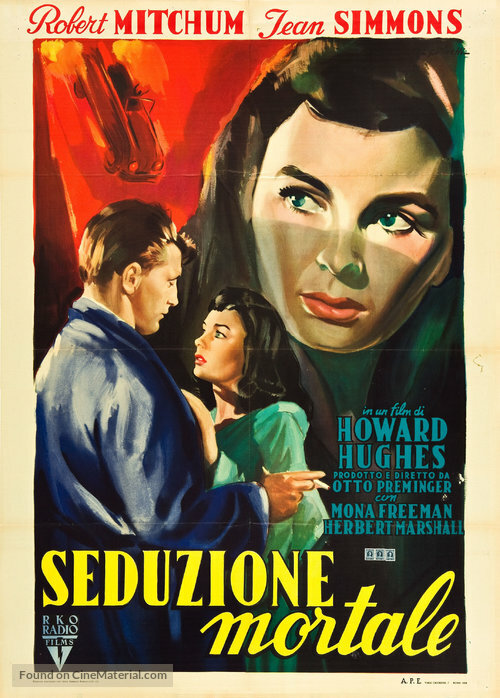 She was usually better than her material – but I can think of a superb film, in which I believe she gives her finest performance: ‘Home Before Dark’ (1958). As Charlotte Bronn, released after a year in a psychiatric hospital, she delivers an enthralling performance, that dominates the story. (She won a Golden Globe for this – as did the film; as did Efrem Zimbalist, Jr. for Best Supporting Actor.) If you do not know this film, beg, borrow, steal – or if you must, buy a copy. Low and behold I checked my shelves and there it is. I’ve moved it to my desk and hopefully it won’t be long before I get it into the player. Thanks for the tip. Do please let me know what you think of it. Like you she melted my heart in Spartacus. I still find her alluring! Will definately look up the links suggested. Best regards. So I’m not alone but in good company. Thanks for dropping by. Great posters reminding me Jean had quite a career. She’s also very good in The Big Country and am remember her in the 1987 Perry Mason – The Case of the Lost Love. 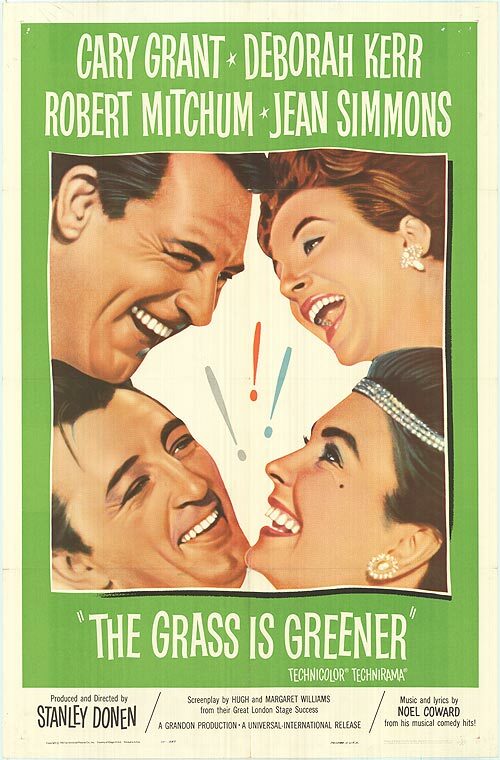 I also remember The Grass Is Greener where she got the chance to play a comedy role. A pity her film career stalled when she go to the ‘old ‘ age of 50! I just watched that Perry Mason movie a couple months ago. It was nice to see her doing some work in later years. She also rejoined Kirk in a so so TV version of Inherit the Wind. I have no idea if it was by choice but yes the roles seemed to dry up for this beautiful lady around the old age number????? She certainly was captivating in Spartacus. A classic beauty. She’s great. Love her in Angel Face, Spartacus, The Robe, Footsteps In The Fog and so many others. Fine list of films there and yes she had plenty more during her run. Thankyou for taking the time to put it on. You really need to see Spartacus. Bonafide classic! She surely was a beauty! Love the photos/posters you choose for this visual post! Thanks so much for your participation to our blogathon! Yes she was captivating. Nice that she turned up in various genres as well. Thanks for putting it on. 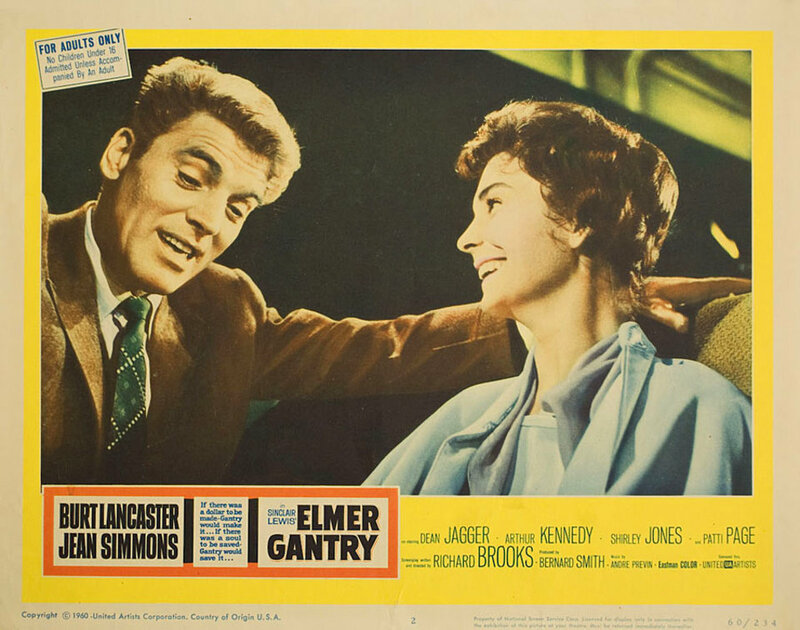 What a varied career Jean Simmons had! Comedy, western, thriller, historic epics… She could do it all! 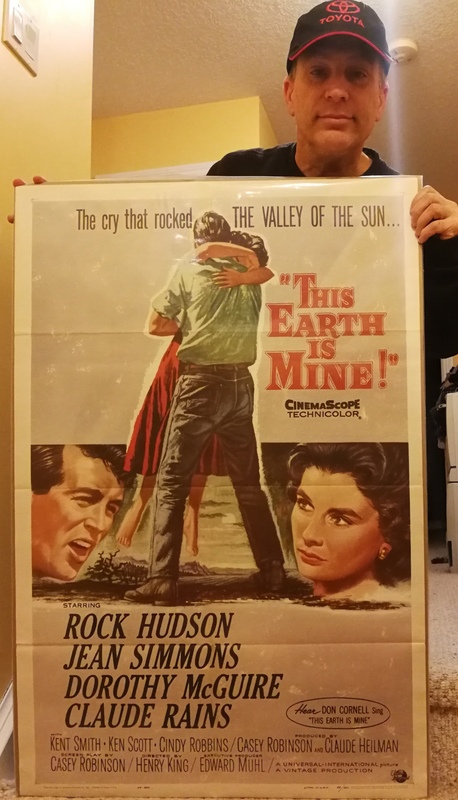 I like your poster for “This Earth is Mine!”. I’ll try to track down that film. Funny I have so many films in my collection but not that one. lol. That’s a tile I’ve yet to see. The others I have of course caught up with. Thanks for the tip. 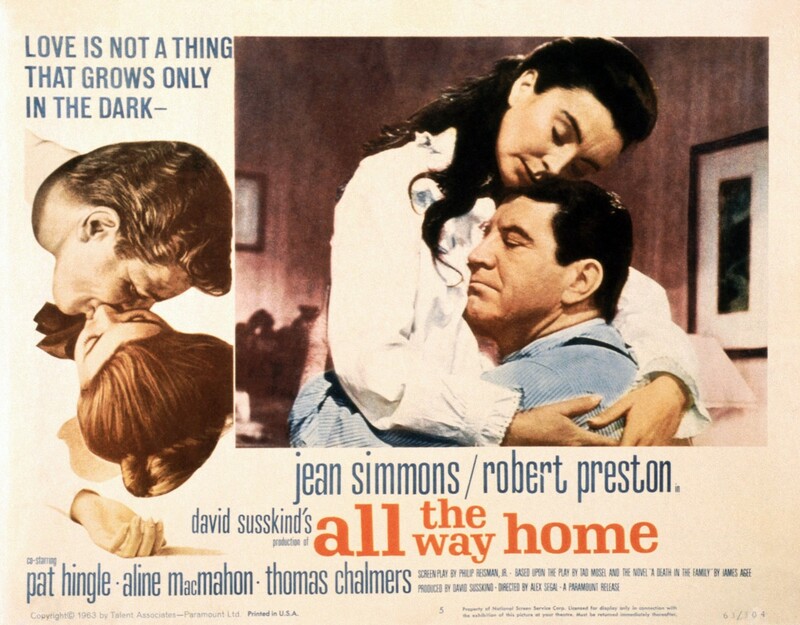 All the Way Home lives in my memory from the only viewing in my teen years. I have longed to see it again. Maybe someday. I checked out your memory on Jean and that’s super! And in Toronto just up the road from me. I did see Chris Plummer there about 5 years ago as Barrymore and that was pretty cool. We saw the Barrymore show as well. Excellent. Love all the posters! Particularly This Earth is Mine-a hugely enjoyable lush overwrought melodrama as delicious as a mug of hot chocolate on a cold day. 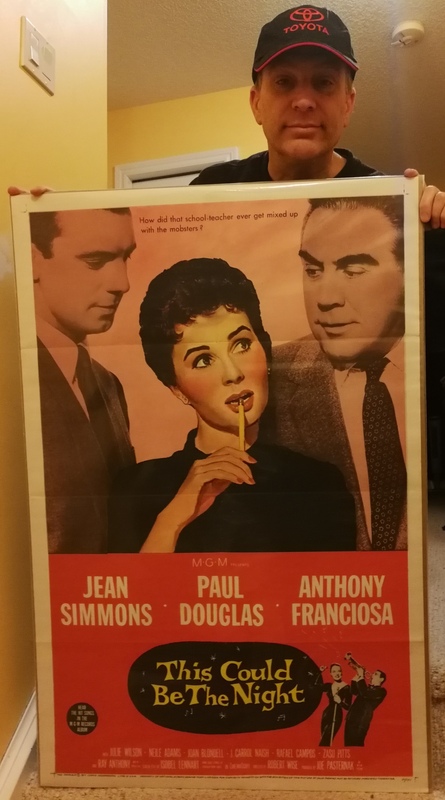 She’s always been a big favorite of mine and I’ve managed to see all but two of her films, one very early-Kiss the Bride Goodbye & a later one which quite frankly sounds awful Going Undercover but which for completeness sake I’ll track down eventually. All the Way Home is definitely worth seeing containing one of her very best award level performances but be aware that it is very downbeat. Before her Hollywood career started in earnest she made some very interesting British films that are also rewarding watches-The Clouded Yellow, So Long at the Fair and Cage of Gold. One from her major star period that seems to not get the attention it deserves is Hilda Crane. 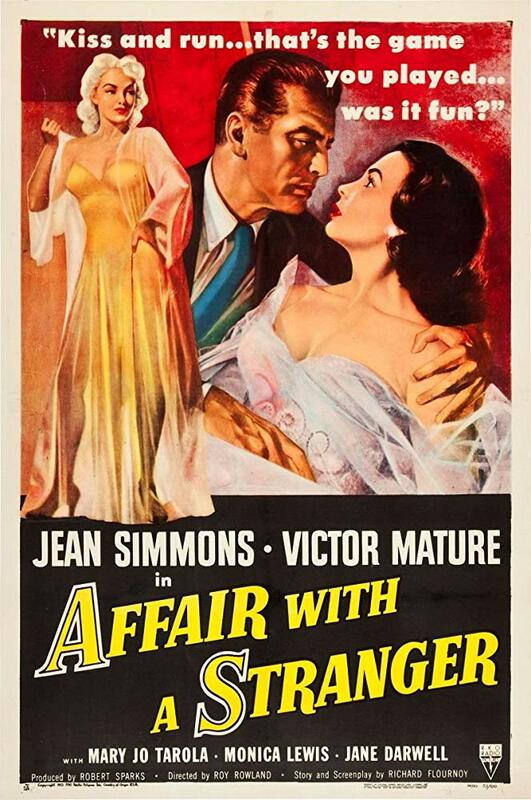 It’s got its issues but the main character is quite an unusual one for a 50’s heroine. Throughout her career she made many fine films but even if the pictures were of variable quality you could always count on her to deliver a fine piece of work. I checked my shelves and find I have at the present time 34 of her films. I do have a copy of Going Undercover but haven’t watched it yet. More proof that I’ll collect any title with a familiar name. I see it also has Viveca Lindfors, another lady from the past. Some great suggestions in there and I’ll look for Hilda Crane. Thanks for the tip. CORRECT ME IF I’M WRONG………….BUT I BELIEVE THAT JEAN WAS PREGNANT WHEN FILMING SPARTACUS! SHE WAS CERTAINLY RADIANT IN IT………….A VERY SPECIAL ACTRESS INDEED! NEEDS WAY MORE ACCOLADES!!! I KNOW SHE HAD A DAUGHTER IN 1961………..MAYBE I HEARD IT ON THE SPARTACUS SPECIAL FEATURES DVD???? Yes she was. Careful filming helped to hide it as did the costumes she wore. Stunning lady.